Image 1 shows 42WLA40000, a typical Type IV. Image 2 shows 42WLA63506; a Type VII. I had always had an interest in Harley-Davidson WLAs but a couple of events in 1985 really set me off on the hunt for my own Liberator. Amazingly in 2011 I was contacted by Charlie Bodycomb, who owned this WLA back in 1985 and stumbled upon these pages while searching the net for WLA info. He told me more about this particular 'Liberator' which was registered in London around 1980 after being imported from Greece by English dealer Roy Harris who got over 35 WLA's plus lots of spares. After renovating most of them very quickly; which consisted of just getting them running, sand blasted as they stood and adding a bit of paint, he had sold them all by 1981. This bike however was kept for himself to ride, as it was the most original and complete, and after a bit of use it was retired to the garage. Charlie heard from Peter Gray (founder of the MVCG in the UK and also a 45 fan), that this bike might be for sale, visited Roy and bought it on Dec 20th, 1982. 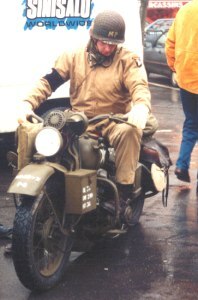 Although it ran pretty well, Charlie wanted to restore the bike properly, so together with Iain Cottrell in Weymouth, (then the 45 expert restorer) he rebuilt the bike completely during the winter of 1983 with the intention of having it sorted and run in to take to the 1984 D-Day anniversary in Normandy, France. Lots of NOS parts were used but he tried to keep as much original as possible. 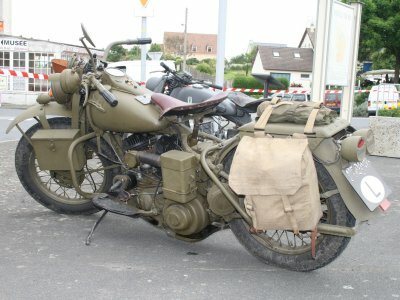 It came together really well, looked great, sounded fantastic and turned a lot of heads as Charlie went on to ride that bike around the UK and to events and WW2 vehicle tours in Normandy and back to Holland, to the Ardennes and Luxembourg. 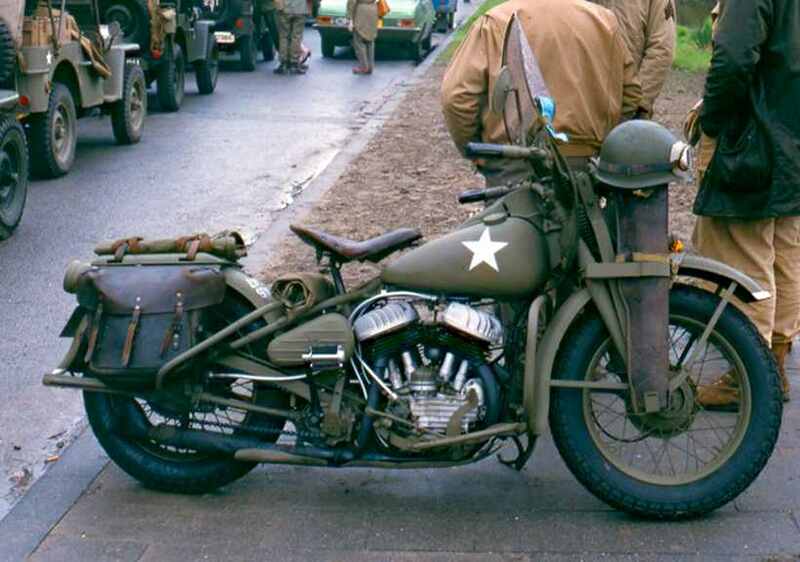 Of all more modern H-Ds and another military 45, this one was the most reliable and best bike of them all. The Ammo Box was adorned with the name 'Dim View', taken from a 15th US Air Forces Photo Recon P38 Lightning. But by 1999 he had got into other things and the prices were getting very attractive at the time, so it was sold through Iain Cottrell to a collector contact of his in Kansas, USA, who got a great, really nice running and complete bike. 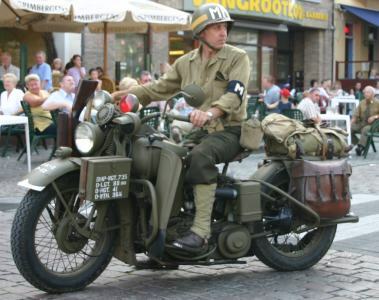 Although he doesn't remember the bike's engine VIN, he knows it was a 1944 model with big data plate, radio suppression fittings and with a gear box and crank case breather fitted. 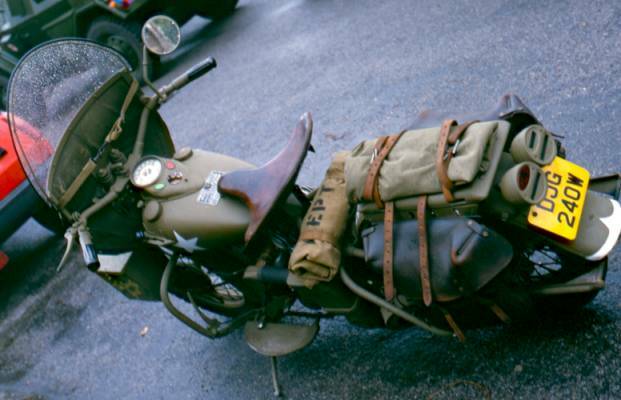 The bike is pictured on pages 33 and 39 of the Osprey Classic Motorcycle book 'Harley-Davidson 45s: Workhorse and Warhorse' by John Carroll + Garry Stuart. 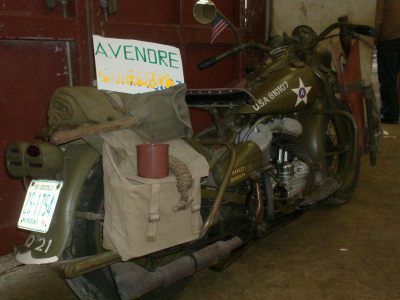 During the 2010 Holiday Season, Harley-Davidson offered a unique 25"x13" commemorative shadow box collectible gift that tells the story of the 42WLA military motorcycle and the significance of Harley-Davidson motorcycles in the lives and war experiences of American service people. The box features original artwork reproduced from archive materials found in the Harley-Davidson Museum. The above box was offered to the webmaster by fellow WLA buff Kent Chipman who obtained it from the local HD dealership at Longview, Texas. 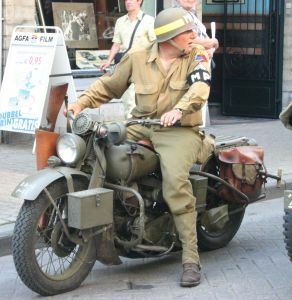 Rumes is a very small village on the French-Belgian border which was 'liberated' by a WLA rider of the 2nd Armored Division 'Hell on Wheels' in early September 1944. One wouldn't expect to see WLA parts fitted to a Jeep and you can only wonder what the advantage of having two WLA windshields fitted to the cowl instead of a standard Jeep windschield really is. That plus the fact that it was done on a Military Police Jeep makes this highly unusual. Two WLA windshields have been bolted unto the body cowl of a 1942 Willys MB Jeep. This picture was taken in France during WW2 and colorised and printed as a postcard. The unit and the identity of the GI remain unknown. 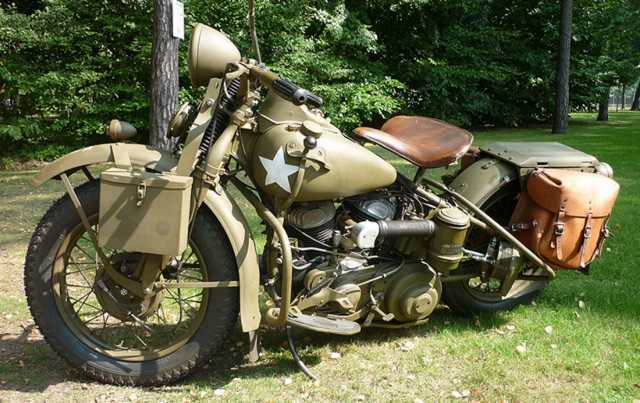 At the request of the US Army, Harley-Davidson built the 42XA, a 45ci opposed twin, shaft drive Motorcycle. 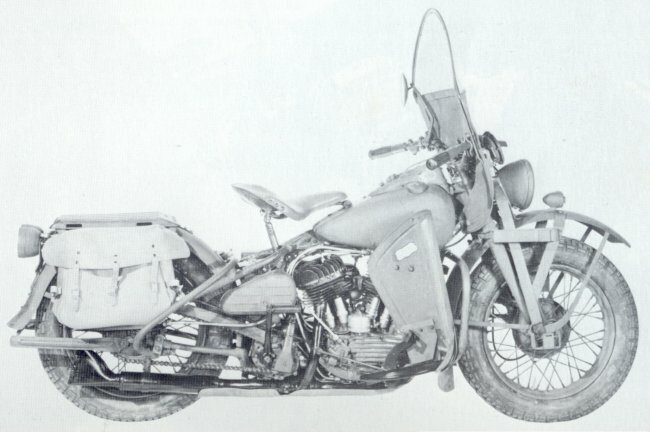 The Army hoped that a shaft drive bike would stand up better against dirt than chain drive motorcycles. 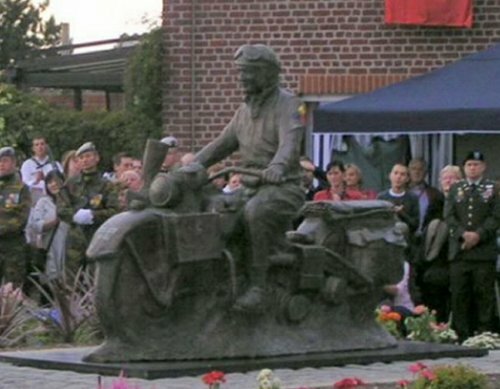 It was patterned after the BMW R71; the motor, transmission and drive train are nearly identical. 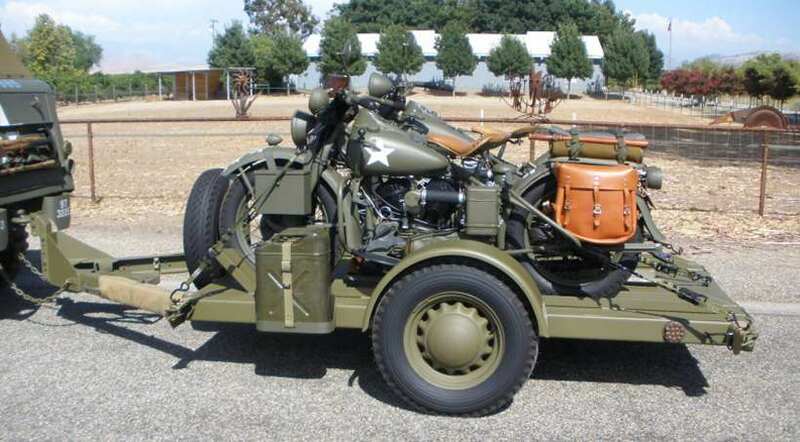 Only 1000 were delivered in 1942, of which some were equipped with solid disc wheels for use in the desert. The US Army Registration Numbers issued were U.S.A. W614903 thru U.S.A. W615902. It was not put into mass-production and probably none made it overseas.... Today a complete 42XA is indeed a rare motorcycle. Below are some rare WW2 images of the 42XA in use by the US Army.... All XAs shown belong to Armored Units which would indicate the majority, if not all, XAs were indeed supplied to the Armored Forces. 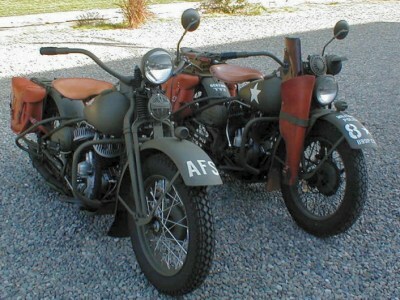 No less than 4 Model XA Motorcycles are lined up during Stateside Manoeuvers early in WW2. 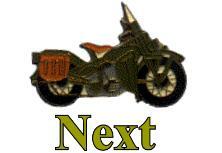 All are equipped with windshields with leatherette apron and at least two have nicknames on the tank. 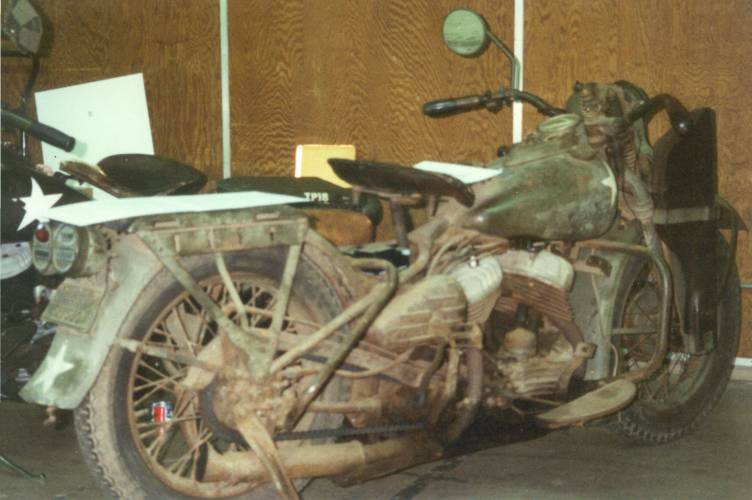 Close inspection of the original image reveals the markings (both 34AR and 34/\)on the front fenders indicate these bikes belong to the 34th Armored Regiment. The 34th Armored Regiment was constituted at Fort Knox, Kentucky and assigned to the 5th Armored Division on October 1st, 1941. 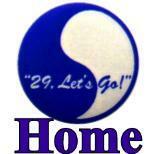 It's 2nd Battalion was redesignated as 34th Armored Bn on September 20th, 1943. 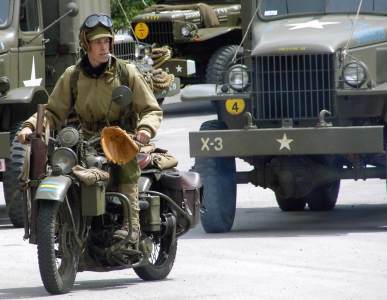 Note the early M2 Half Track and Jeep in the background. 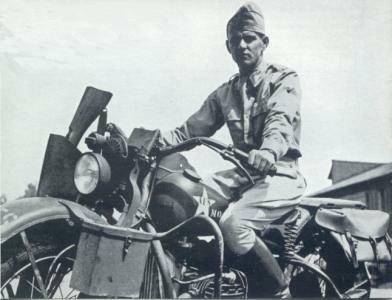 Left: Lt John E Harley (son of W S Harley, Chief Engineer and one of the founders of H-D Co) served in the Armored Corps in WW2. 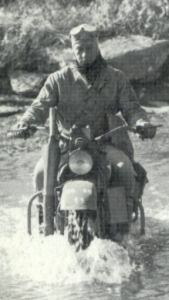 Right: A 2nd Armored Division Messenger fords a river during maneuvers in April 1942. 42WLA4632: the earliest restored 42WLA in Europe??? 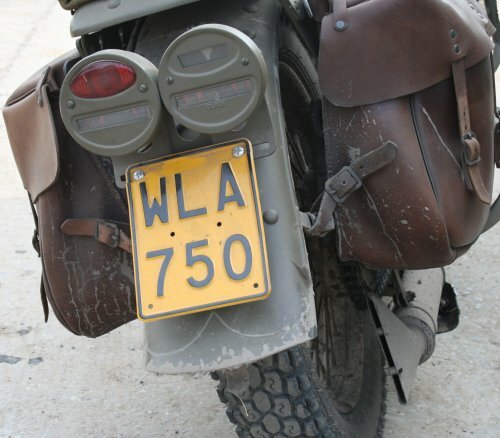 After having ridden his bike, a mixture of both early and late WLA and WLC parts, for many years; Dutchman Moos Raaijmakers decided to bring this WLA back to its Engine Number matching configuration in the summer of 2013. 42WLA4632 was produced as a Type 1-A 42WLA and as such sports a headlight mounted above the horn and early round Oil Bath Air Cleaner (HD #1401-42M Type 1). 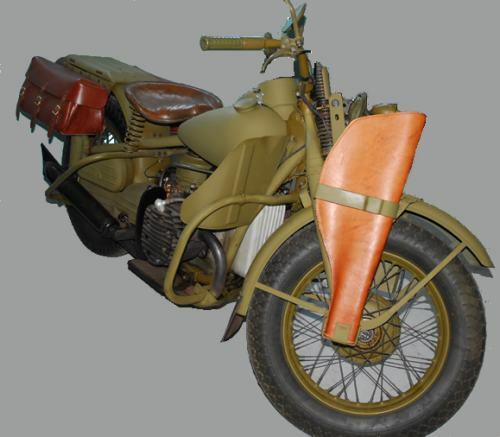 The Type 1-A 42WLA was built between 1st September and 20th November 1941 and is the earliest 42WLA model produced. 41WLA6854 and 42WLA49559 are both owned by Steve Gregori from California. 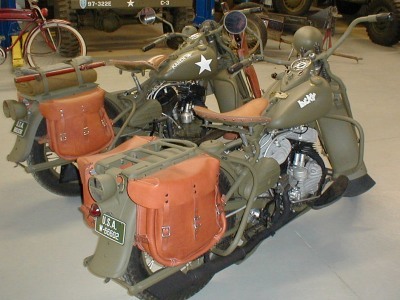 Both bikes were restored by Steve LeMay in Virginia and they look stunning! 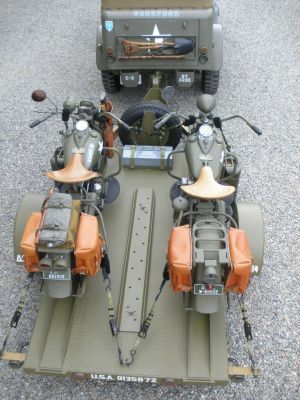 The trailer was designed to look like one that might have been shop built on an Army post during WWII. 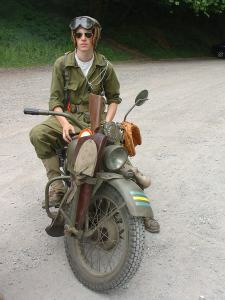 The wheels are 1936 Chevrolet and all the hardware is WWII GI. The guys building this trailer during the war, would have gone to Supply and got some pieces they needed to build this trailer. The D-rings are Ben Hur trailer, the grab handles are Jeep, the reflectors are King Bee No. 295s and the tail lights are GI. 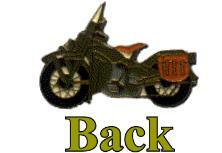 The markings ( /\S-DR MT-14 ) are for an Armored Force Demonstration Regiment stationed at Ft Knox during WWII. 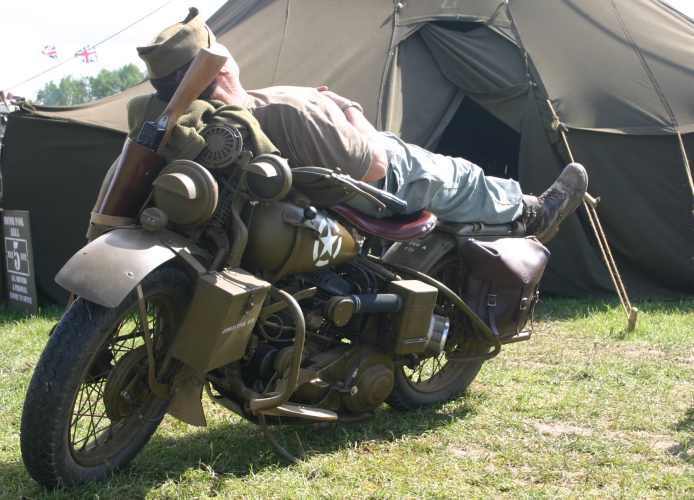 This unit would have gone to other posts to demonstrate the use of the Harley WLA to new GI's. The 41WLA "Lucky" is also marked for the Armored Force School at Ft Knox. The gray WWII tool box on the deck belonged to a mechanic who worked at Hammer Field AAF Base refueling WWII aircraft used for training at that base. It was gray originally and is used to carry tie-down straps and other securing items in it. 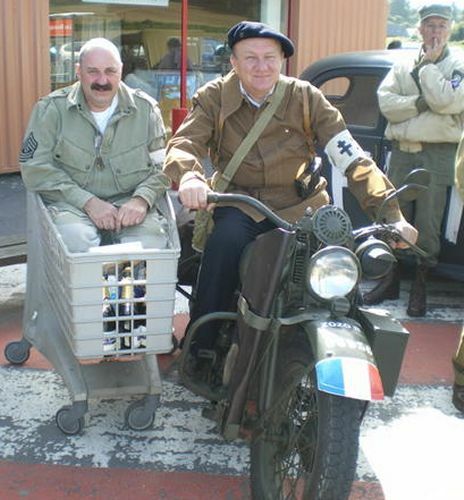 A member of the French Resistance transports an American Paratrooper without a Motorcycle Driving Permit shortly after the Invasion of France of June 1944. 42WLA60650 was up for sale at the October 2007 Show at Ciney, Belgium. 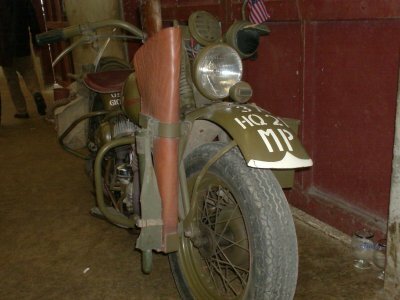 The bike was fitted with a number of early parts which did not fit the Type VI it really is. 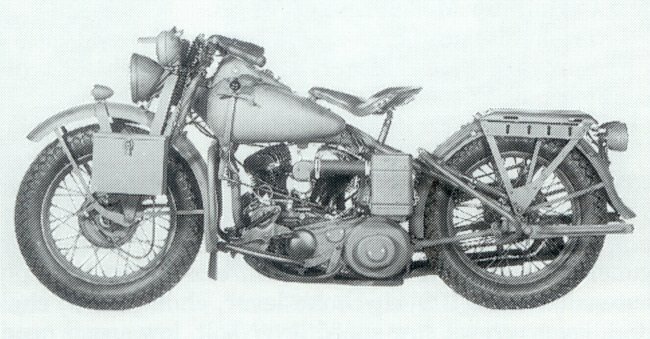 Notably the 16" rims, after market style horn, high Ammo Box, unpainted crankcase and cylinder heads, early style Data Plate and first pattern Front Fender were incorrect for this bike. 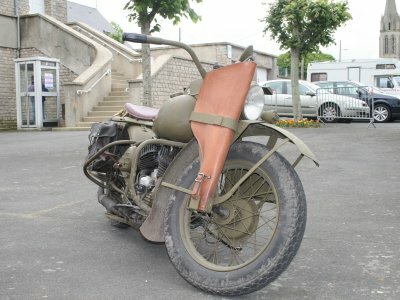 By the time I saw the bike again in Normandy in June 2008, the new owner had fitted the correct parts and repainted the bike in a more appropriate olive drab color. 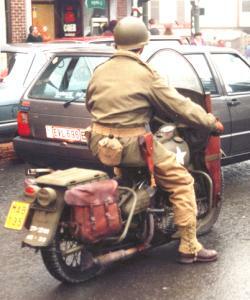 William Witmeur astride his 42WLA in May 2005. In the background on the right image is the late Patrick Hulin's ultra-rare Chevrolet K51 Signal Corps Panel Delivery Van. The complete story was related in the MVPA's Army Motors Issue 73, Fall 1995. I photographed the bike at the 1996 MVPA Convention at Portland, Oregon, USA.